The nation's biggest owner of television stations forces its newsrooms to become propaganda mills. Only a few decades ago, this would have been unthinkable — and illegal. The firestorm over Sinclair Broadcasting, the largest television-station owner in the United States, requiring right-wing talking points to be aired on its local stations, raises a question: How did we get here? The answers go beyond the extreme polarization that characterizes the country today. The Sinclair controversy is years in the making. It’s a cautionary tale of deregulation, regulators captured by special interests, and the influence of big money in politics. Lessons can be applied across the economy, with banking being one prominent example. But there’s a difference. Without serious journalism and a vigorous exchange of ideas, self-governance becomes undermined. Demagogues and fascists rise. This is why the Framers enshrined freedom of the press in the Constitution. It’s why every freedom-destroying regime in world history first sought to destroy independent media. In the United States a century ago, the new medium of radio was carried on what were considered public airwaves. Regulation began in 1912, with the federal government issuing licenses to budding operators. As the medium exploded in popularity, Congress passed the Radio Act of 1927, which gave the government authority to assign frequencies and power levels to companies or individuals who wanted to own stations. Importantly, it required that stations serve the public interest. This was enforced by the Federal Radio Administration and its 1934 successor, the Federal Communications Commission. The FCC tightened the public-interest rules in 1949, as television was being birthed. Stations receiving free licenses worth huge sums to their bottom lines were required to provide balanced coverage of important issues. The agency also enacted the Fairness Doctrine. This required more than granting airtime to opposing views of a controversial issue. As a Congressional Research Service report put it, “Broadcasters instead had the affirmative duty to determine what the appropriate opposing viewpoints were on these controversial issues, and who was best suited to present them.” If someone was attacked personally, the station must contact the individual and allow him to respond. Because FCC licenses were periodically reviewed, broadcasters took this obligation very seriously. This consensus endured for several decades. The issue of concentrated industry control was also an early problem, as CBS and NBC built nationwide networks. Mutual Broadcasting complained about the dominance of the two and the difficulty of starting competing outlets. After a years-long court fight, NBC’s “blue network” was sold to the upstart American Broadcasting System. Also, although the networks exercised great power, ownership of stations was overwhelmingly local. One example was a Baltimore FM station that began broadcasting in 1960, licensed to Julian Sinclair Smith, an electrical engineer. He and his family added a television station in 1971, the beginnings of Sinclair Broadcasting Group. The Fairness Doctrine was a victim of years of lawsuits and deregulation by the administration of Ronald Reagan (who started out as a radio broadcaster). It was essentially ended in 1987. This opened the way for the success of Rush Limbaugh and imitators, who couldn’t have broadcast their shows without balance under the old rule. The Telecommunications Act of 1996, passed by a Republican-controlled Congress and signed by Democrat President Bill Clinton, lifted the limits on ownership of radio stations. 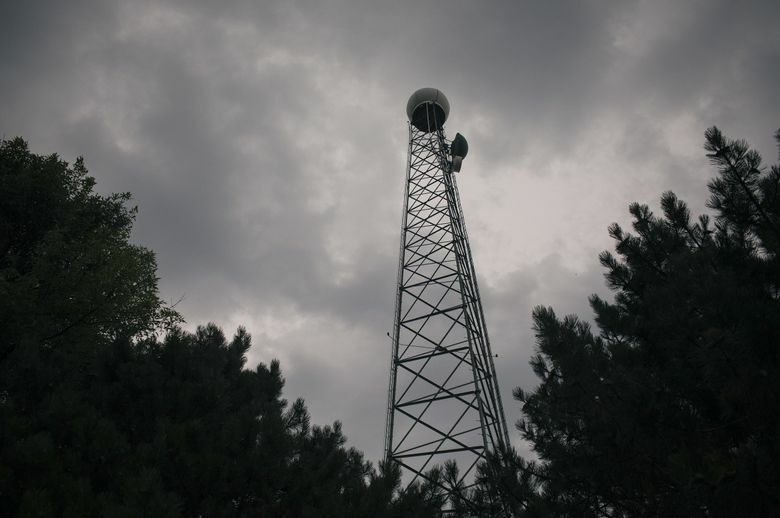 Thousands of local stations were snapped up by a few ever-bigger owners. As for the government watchdogs, they became ever more captured by the industry they nominally regulated. Ajit Pai, President Donald Trump’s FCC chairman has been especially aggressive in rolling back rules. This landscape helped Sinclair reach its commanding heights. The climb included acquiring Seattle-based Fisher Broadcasting, owner of KOMO and other stations, in 2013. The challenges facing local news aren’t Sinclair’s doing. But unique among large broadcasting corporations, Sinclair orders its journalists to slant coverage and to air propaganda on the public airwaves. Hoover and the architects of the 1920s consensus would be rightly scandalized. The press attempts to present what journalist Carl Bernstein calls “the best obtainable version of the truth.” In my experience, newspapers have their blind spots and blunders, but they abide by strict ethical rules. Opinion and news are separate. Columnists like me, allowed to have a voice, abide by similar strictures and can’t persuade if we don’t back opinions with facts. But news consumers aren’t entirely without options. We have responsibilities as citizens, too. That means we can turn off irresponsible broadcasters. We can watch legitimate television news and subscribe to good newspapers. We can educate our children and ourselves in civics. And carry the embers of the republic in the hopes that elections can undo some of the damage. Jon Talton: jtalton@seattletimes.com; on Twitter: @jontalton. Jon Talton comments on economic news, issues and trends, with an emphasis on Seattle and the Northwest.